Deezer will today roll out a specific football section on both its web and app-based services, offering live match commentary in partnership with talkSPORT in the UK. Following on from launching its podcast library in May this year, supplementing its music library of some 35 million tracks with around 20,000 podcasts, the new service is bringing a world of football to the audio streaming service. Available both on the mobile and desktop versions of Deezer talkSPORT is partnering with the service to offer live match commentary on sixty-four Premier League games this year. "As the audio streaming landscape evolves it is important for us to work with the platforms that are leading this change," said Scott Taunton, COO for talkSPORT's parent company, UTV Media, "and by partnering with Deezer, we are bringing the best football content in the world to those who matter the most – the fans." As part of the new football service Deezer is also going to be supplying football podcasts, match fixtures and results as well as live updates and even footie-related music playlists for those moments when you're just itching for a kickball fix no matter what. 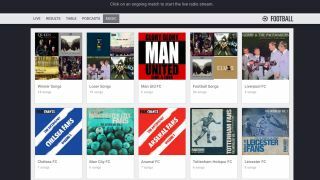 At the moment the Deezer's footie service is limited to Premier League games and teams, only showing results, fixtures and fan-chant playlists from the top UK league. The service is also live-streaming commentary for all Bundesliga fixtures in Germany. "Football is a major passion for many of our listeners, and we wanted to find a way to bring them closer to what they love," said Alexander Holland, Chief Content and Product Officer at Deezer. "Our new dedicated Football section means that fans can easily stay on top of match results, listen to live games, and catch-up on the latest podcasts. With Deezer Football you now have access to even more of your favourite audio content in one place." The new update is going live today in Deezer's app section, for both the ad-supported and Premium accounts, so you'll start to see the beautiful game invading the music streaming pitch very soon. What's the difference between the audio streamers?